It's your body. Take control. Preconception health refers to the health of women throughout their reproductive years - the years when a woman can become pregnant. Making sure that women of reproductive age are healthy is one of the best ways to ensure the success and well-being of future generations. It is also an important part of ensuring the health of women throughout their lives. Preconception care aims to improve birth outcomes by promoting the health of a woman prior to pregnancy, whether it is her first or a subsequent pregnancy. It presents an opportunity to improve women's overall health as well as that of tomorrow's children. Preconception care is more than a pre-pregnancy visit; it should take place in an ongoing manner over the course of a woman's lifespan, beginning in early adolescence, before she is able to become pregnant, and continuing through her reproductive years. In 2013, Alabama women gave birth to 58,162 infants. The health of these women prior to pregnancy impacted birth outcomes. The graph below represents the percentage of live births in Alabama in 2008 and 2013 by health behaviors, experiences, and conditions among these women just prior to becoming pregnant. 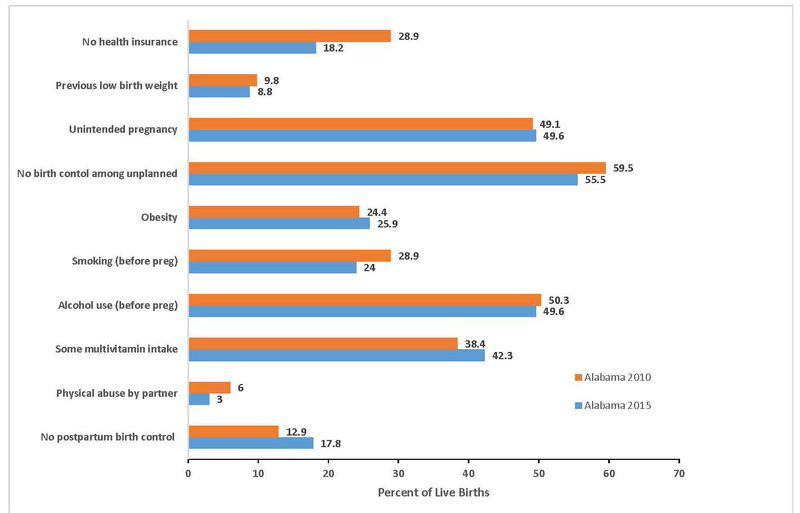 These data come from Alabama's Pregnancy Risk Assessment Monitoring System (PRAMS). PRAMS is an ongoing population-based surveillance system developed by the Centers for Disease Control and Prevention. It is designed to collect information on self-reported maternal behaviors and experiences that occur before, during, and shortly after pregnancy among women who deliver live-born infants. Because PRAMS data are population based, findings are generalizable to an entire state’s population of women who have delivered a live-born infant.